My firstborn wasn't a big fan of the pram, so I really hoped that my second one would take to it. When Little Guy was born, I didn't go out much, and so didn't find the need for using a pram. I was also carrying him in a newborn carrier. Of course, for longer outings you do need a good and comfortable stroller. 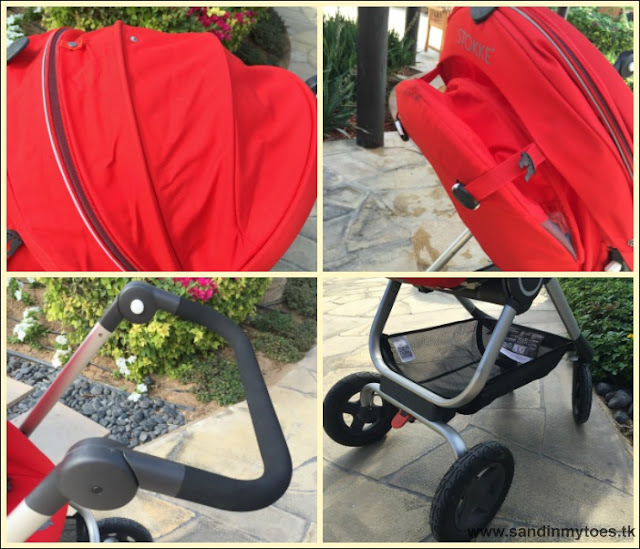 We had already picked the Stokke Scoot in its beautiful bright red as our stroller of choice. It just looked so comfy, I thought it would be perfect from the newborn stage onwards. The Stokke Scoot has a frame with large wheels on which the seat is placed. I received the frame, the canopy, wheels, mosquito net, and rain cover in the box. It was quite easy to assemble. There are no tools of any sort required to get this stroller going. Everything from the wheels to the seat just click into place. There are belts on the canopy allowing three levels from the lowest incline, to the upright. The seat can face either the parent, or outward, as required, without much of a hassle. The shoulder straps can also be adjusted across three heights, and there are shoulder pads for comfort. The harness is three-point and easy to lock. The stroller definitely gets points for looks. It' s a beauty with smooth lines and curves, and when I use it, people often come for a closer look. Initially, the baby didn't quite enjoy being in the stroller. This was when he was about a month old. One of the reasons behind this could be that there is no padding suitable for a newborn, and also that the seat is inclined even in the lowest position. It does not become fully flat. We did not have the Newborn Insert that you can buy to make it comfortable for a little baby. As a result, we only properly started using the stroller when he was about three months old. 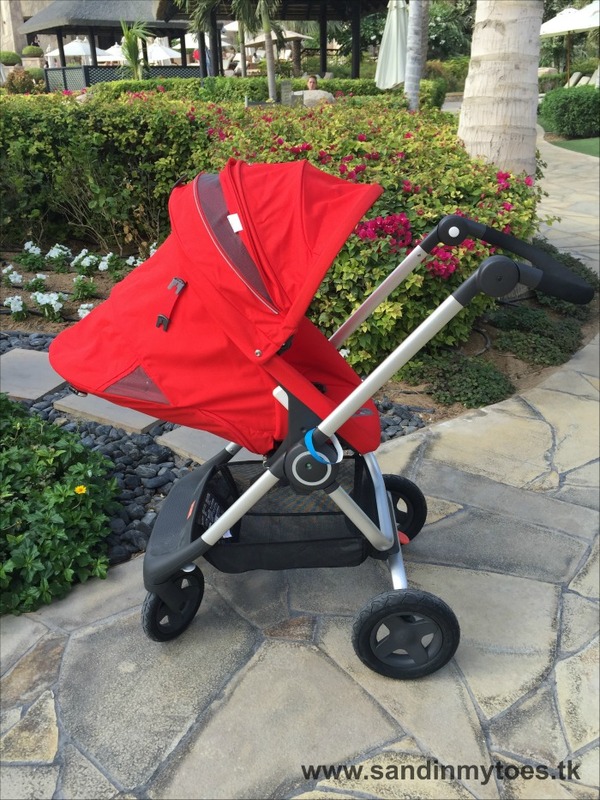 The canopy shade can extend quite far ahead than most strollers, and even has an extended cover for more sun protection. The fabric also provides UV 50+ sun protection, and makes the baby well shaded for sleep, which they do a lot between the 3 to 6 months age. One of the features I really like is the ventilation on the sides of the canopy where the baby's head lies. Not only does it prevent it getting too hot in there (essential for a country like UAE), it was also nice because he would get a glimpse of the outside world! There is also a ventilation on the top of the canopy which you can use to peek at the baby when the canopy is fully open. The wheels are wonderful in many ways, despite their size. I used it successfully on pebbled paths, shallow sand, and grass. 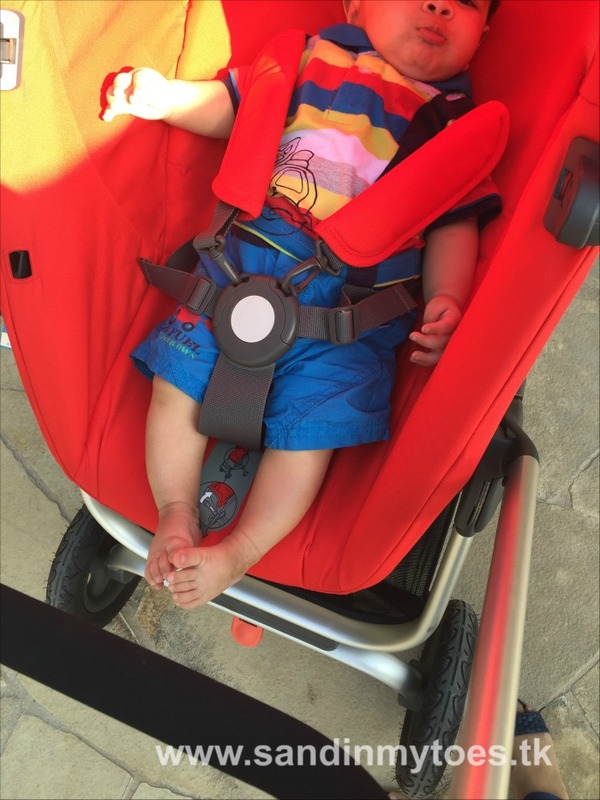 The shock absorbers in them let my baby sleep even when crossing on rough surfaces. He would hardly feel the bumps, and this was such a relief, because it's best to let sleeping babies lie! The most noteworthy feature of the wheels is that they swivel completely, making maneuvering the large stroller quite easy. The basket underneath the stroller is also quite spacious, and can carry quite a bit of weight (up to two kgs.). With two kids, I tend to carry a lot, and this has been a useful feature of the Scoot. Another very useful feature is the handle can be adjusted to four positions, to suit your height. I even used the inward position (actually for folding the stroller) to get closer and talk to the baby. The only challenge I faced with the Stokke Scoot is the opening and closing mechanism which takes some getting used to. It's also heavy at 12 kgs, so not something you can use single-handedly. When folded, it occupies a wide space so you need to have room in the boot of your car. I loved the Stokke red so much that I accompanied the stroller with their very stylish diaper bag. The zipper opens in a curved shape and can accommodate surprisingly a lot. 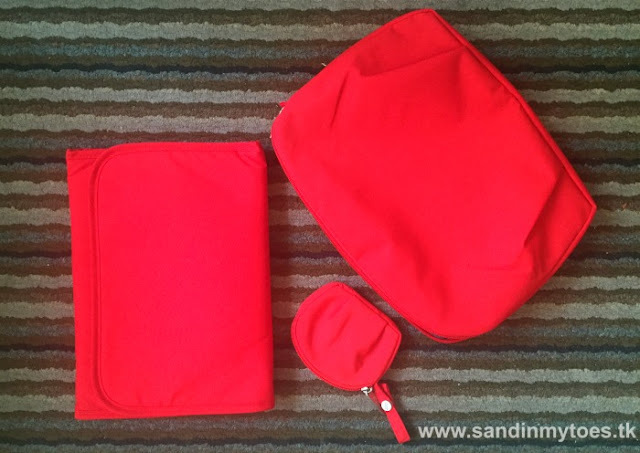 It has pockets in the front, back, and inside so you can organize your things carefully and retrieve them easily. It comes with a matching changing mat, and coin purse. 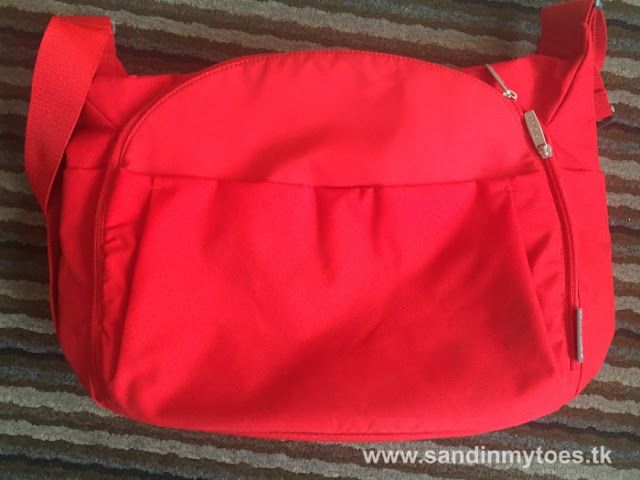 The bag also has wide straps for carrying comfortably, and is quite lightweight in itself. It bag also has hooks that you can attach below the stroller when out and about. All in all, the Stokke Scoot has become such a part of our lives that I think we'll be using it for at least two more years. If comfort is what you're after, the Stokke Scoot is an excellent choice. It is available in the UAE at Mamas and Paaas, Mothercare, and Just Kidding (details here). At $700, this is an expensive stroller, but design-wise it has some well thought out features that you would not find in many others. For more details on the stroller, and specifications, visit the Stokke website. We were provided the Stokke Scoot for the purpose of review, but all views and opinions are my own.